Build a new aviation brand from the ground up, online and off. Tell a unique story of aeronautic imagination, while keeping within Honda's long-standing brand traditions. Communicate the engineering's artful blend of technology and human considerations. 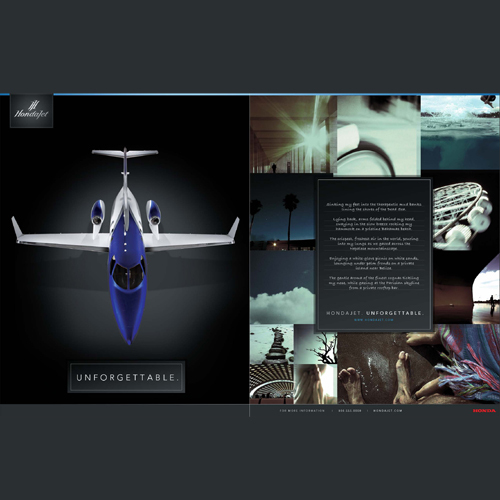 Addy Award-winning website plus newsletter, print campaign, and trade show kiosk that conveyed the jet's elegant balance of stylistic visual design and inspirational but technology-rich content. Within 10 days of launch, the overall digital campaign helped exceed first-year sales goals by 600%.